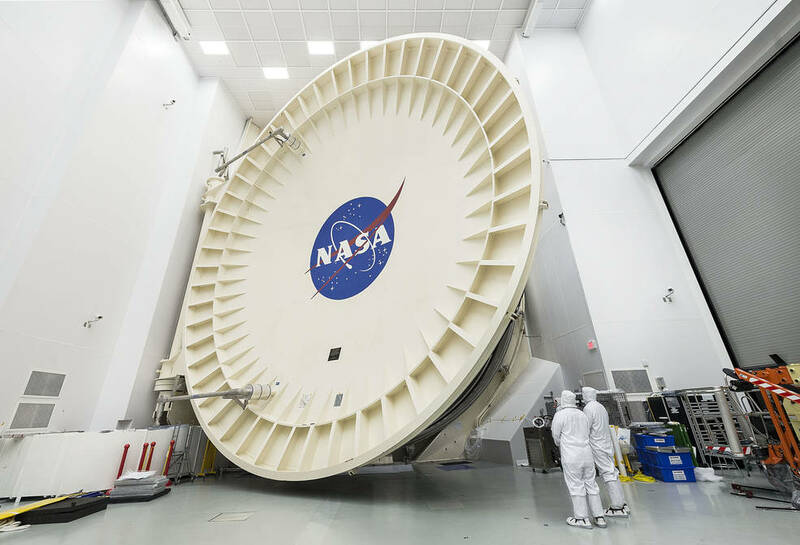 July 12, 2017 – The vault-like, 40-foot diameter, 40-ton door of NASA’s Johnson Space Center’s historic Chamber A sealed shut on July 10, 2017, signaling the beginning of about 100 days of cryogenic testing for NASA’s James Webb Space Telescope in Houston. Don’t be fooled by Chamber A’s now monolithic look. Behind the hulking door, the process to transform the chamber’s interior to match the airless, frigid environment of space will soon begin. It will take about 10 days to pull the air from the chamber, and then about one month to lower the temperatures of the Webb telescope and its scientific instruments to the levels required for testing. In space, the telescope must be kept extremely cold, in order to be able to detect the infrared light from very faint, distant objects. To protect the telescope from external sources of light and heat (like the sun, Earth and moon), as well as from heat emitted by the observatory, a five-layer, tennis court-sized sunshield acts like a parasol that provides shade. The sunshield separates the observatory into a warm, sun-facing side (reaching temperatures close to 185 degrees Fahrenheit) and a cold side (400 degrees below zero). The sunshield blocks sunlight from interfering with the sensitive telescope instruments. The James Webb Space Telescope is the scientific successor to NASA’s Hubble Space Telescope. It will be the most powerful space telescope ever built. Webb is an international project led by NASA with its partners, ESA (European Space Agency) and the Canadian Space Agency.